At about 7 we got up, had a banana breakfast, packed up, and put the panniers on the bikes. Chris of course was well practiced by now, but it took me a little longer. I hadn’t quite sorted out where things should go, but I had decided that my sandals had to be highly accessible – my roadie cycling shoes, red and sleek, were very very tricky to walk in! 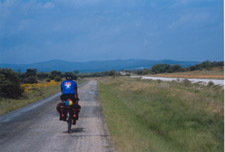 By 8.30, we were heading west, on the main road (N120) towards Astorga. The weather was sunny, and the road was good. By half past ten we were there, and saw children, dressed up for the occasion (quasi bridals outfits for the girls), heading for the cathedral with their parents. They were making their first communion, so it was a really special occasion. We paused to put on waterproofs, but after a little while, stopped to take them off; the storm had passed us by. We passed through the village of Rabanal, where the CSJ run a refugio, and then, the road began to climb quite steeply, and I was very glad to have low gears. 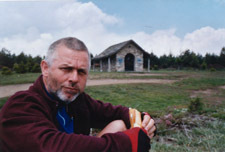 We stopped briefly at the abandoned village of Foncebadon – interesting, and a rest from climbing! 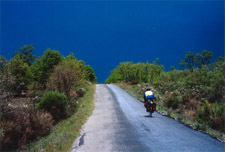 Then we carried on – the road continued to climb, and I was pedalling at a steady 7 kph in the 29 inch gear. This is what a 22t chainwheel is for - steady, long climbing!! Click here for more photos. 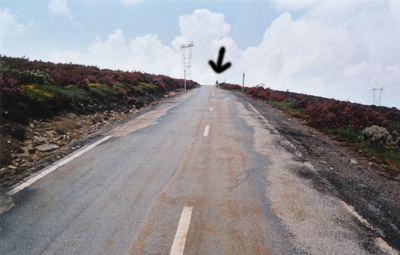 We reached the Cruce de Ferro, at 1500 metres, higher than anywhere in Britain (and not quite the top of the climb!). 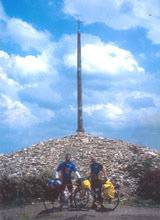 It is a tall cross of iron a with huge pile of stones around it. The stones are brought by pilgrims, from their home, and represent the burden of their sins. The height of the pile suggests either lots of sinful pilgrims, or lots of unburdened ones! Chris was standing looking up at the cross, and I was just about to say something irreverent when I realised he was praying. I knew that he and Jane had had a very tough five years, and said something to acknowledge this. It was special being together at that place at that time. After we’d put our stones on the pile (Chris scandalised me by just picking up a nearby stone and putting that on!) we took photos, and chatted with a Spanish pilgrim who was walking. Chris made him very happy by the gift of a film– he’d run out. The brothers and their bikes. We also talked to three Dutch cyclists who we had previously passed while they were walking up. They had come all the way from Holland, on their bikes which were very much roadsters, solid, ‘sit up and beg’ riding position, and laden with luggage. I was impressed! Our lunch was bread, delicious cheese, and fruit, and thus fortified, we tackled the last three kilometres to the summit, before beginning our descent. This was narrow, with some proper hairpins, and it was as we were swiftly approaching one of these that Chris yelled at me to slow down. I braked hard, and saw that the storm we’d seen earlier had washed rocks and gravel right across the road, just on the corner! Hitting that lot at any speed would have guaranteed a crash! So we took the rest of the downhill fairly gently, especially through the village of El Acebo (cobbles – and the site of at least one cycling pilgrim fatality). Our stop for the night was in a small, pleasant refugio in Riego de Ambros. We were welcomed by the young warden, and having chosen bunks in the dormitory, we did some clothes washing, and I checked my bike for anything loose, then oiled both machines. There were only a few other pilgrims staying, including a French girl who was suffering a great deal with her feet. We went through the pretty village to a restaurant for a cheap and very pleasant ‘pilgrim meal’. The waitress was concerned that I should have enough to eat, despite being vegetarian. She succeeded admirably. It was great to chat and reminisce with Chris – ordinary life can be so much rush rush, busy busy, that it was good to be stepping aside from all that for the duration of the journey, and have time for some brotherly bonding. For some reason, as we enjoyed the second bottle of wine, I got it into my head that Chris needed to be protected from drinking too much, so I made sure there wasn’t too much left for him…. Later, after a winding walk back to the refugio, with only one or two wrong turns, it was really difficult climbing up into my bunk – maybe all that wine wasn’t quite such a good idea….